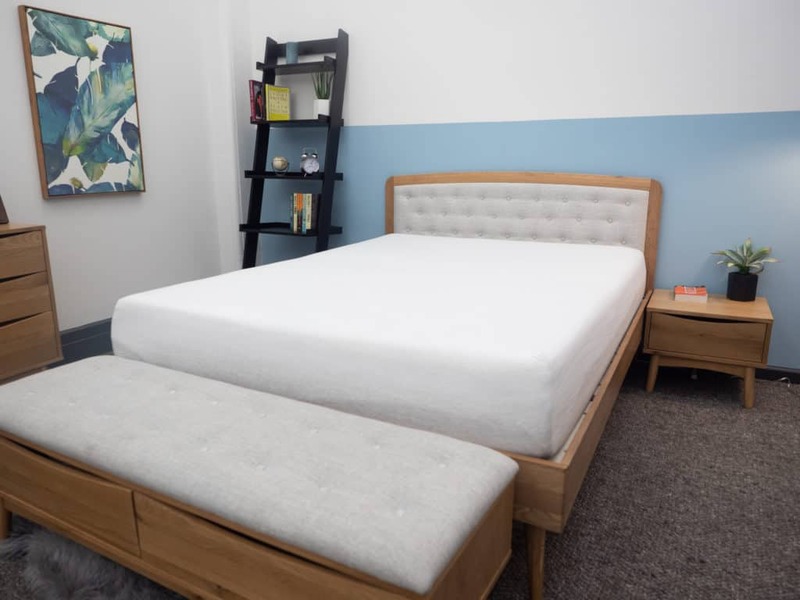 Casper Wave Mattress Review 2019 Update - Is It Worth It Compared To Original? 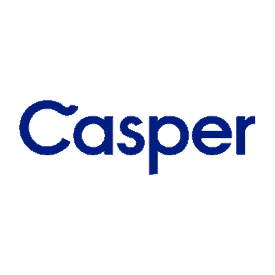 Casper is one of the best known brands in the bed-in-a-box industry — thanks to its reputable mattress line, with smart branding to boot. Today I’ll be reviewing the Casper Wave, an all-foam mattress model that aims to be more luxurious than other Casper beds, and, as a result, a bit pricier too. Does the newer, luxury design warrant a bigger price tag? What makes this different from other Casper beds? I’ve reviewed The Wave before, but Casper has recently updated a few key materials, so it’s time for another look inside! Continue reading as I dive into the construction of mattress, run a few tests, and talk a whole lot about foam. If you’re short on time, simply click here to jump down to the review summary. Casper launched in 2014, and right out of the gate proved to be a strong contender in the bed-in-a-box industry. The company sold over $1 million in mattresses in its first month, and is now seen as one of the most successful brands in the business. While they originally only sold products online, they eventually opened up retail stores around the U.S., in addition to having a strong presence through retailers like Amazon, Target, and Nordstrom. Along with its growth came the introduction of a few more products, including the Casper Essential, a basic, budget-friendly version, and the Casper Wave, a more luxurious option. The company also sells pillows, duvets, bed frames, and more. If you’re a lucky enough traveler, you might even receive a Casper pillow on your next Transatlantic flight, too. The Casper Wave is an 11.5” all-foam mattress comprised of five foam layers. There’s contoured foam, supportive gel, a humidity-fighting cover, and more. Let’s take a look under the covers! Cover – The Casper cover is made with a mix of polyester, wool, and rayon. Casper claims the cover helps fight humidity, which makes sense, considering wool helps to wick moisture and regulate our body temperature. Overall, while the cover is thick, I found it to be breathable while still producing a cozy, sweater-like feel. Comfort Layer – The comfort layer is constructed with a polyfoam that is super soft, light, and airy. The polyfoam gives into pressure really quickly, so you’re likely to sink into the top of the mattress. Bounce Layer – Below the soft polyfoam is a layer of latex foam. This material has a quick response to pressure and is quite bouncy, so you won’t feel trapped in the bed. Latex foam does a good job of dissipating heat, so air should be able to move freely through this foam. Contour Layer – Below the latex is an inch of memory foam, which provides the sleeper with body contouring pressure relief as you sink deeper into the mattress. However, the fact this foam is under the latex helps defend against feeling stuck. It also ensures heat won’t get trapped, an important design detail given memory foam often runs hot. This strategic order of foam is found in all Casper models. Transition Layer – As we near the bottom of the bed, there’s a polyfoam transition layer that offers some support. 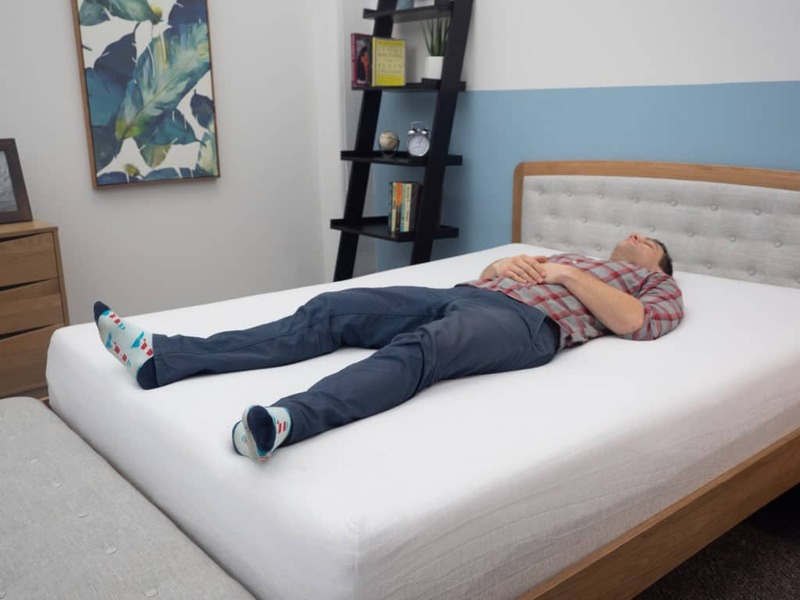 This foam also includes a firm gel — called Zoned Support — which is essentially extra support placed in the center of the mattress. This helps prevent your hips from sinking too far into the mattress, a good quality for stomach and side sleepers! Base Layer – The bottom layer of The Wave is constructed with a really firm, high density poly foam that provides solid support for the entire structure. A key quality here is there are contoured channels cut into the base of this layer, which should allow your shoulders to sink in — providing ample pressure relief while keeping your spine aligned. Now that we’ve looked at what’s inside the Casper Wave, let’s talk about how it actually feels. I’ll describe what I felt after rolling around the bed, which should give you a basic idea of what you could also experience. To begin, I’d give the Casper Wave a 6 out of 10 on the firmness scale, labeling this bed a touch softer than a typical medium-firm feel. 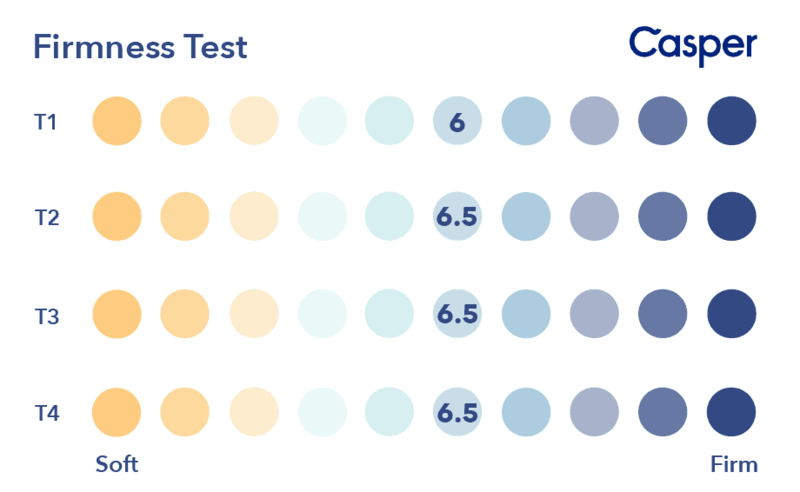 I asked a few other testers what they found, and they rated The Wave a 6.5/10, providing a pretty general consensus across different body types. 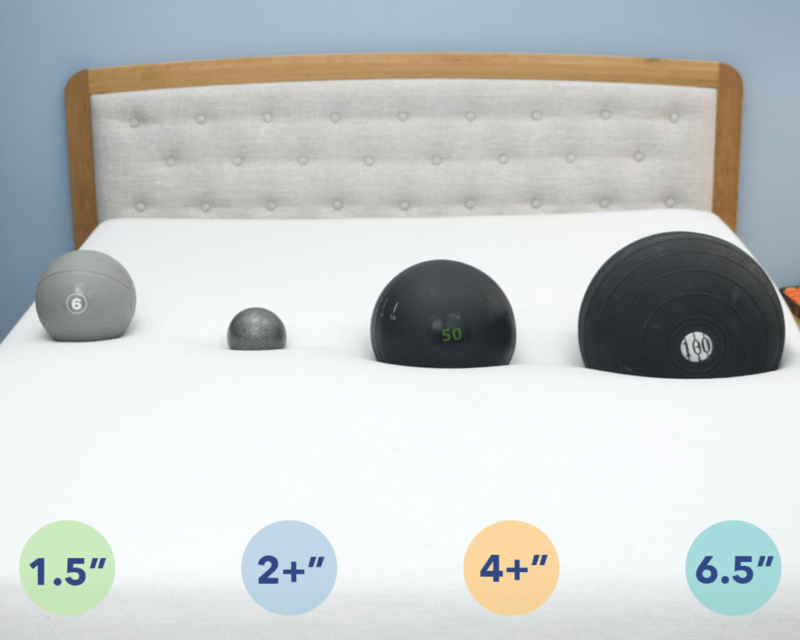 This rating indicates the Wave could be great for combo sleepers who need to strike the right balance between gentle pressure relief and firm support, so they can move around and change positions. When I laid down on my back, I felt nice pressure relief as I sank in — the gentle foams up top filling in the space at my lumbar region for some pleasant pressure relief. I could feel the materials contouring to my body, but the quick response to pressure from the poly foam and latex layers helped to position me on top of the bed. When rolling onto my side, the Zoned Support from the transition foam layer really shone through; my shoulders had space to sink into the top layer of the mattress while the study, gel foam assured my hips were supported and my spine stayed aligned. All in all, The Wave has a plush feel, but it doesn’t feel like I’m being engulfed by the bed. The combination of the gentle comfort foam with the bouncy latex and firm Zoned Support created a luxurious, balanced feel. While I do sink a bit, The Wave still provides good mobility, most likely because of the firm gel foam in the transition layer of the bed. I also felt that the mattress relieved pressure quite well — especially for side sleepers who need something soft for their shoulders and hips to press into. A fool-proof way to decipher if a mattress will relieve pressure is to put it to the actual test. I got out my handy pressure map, which can visualize where pressure points could form, and placed the map on top of the mattress. From there, I lied on my back, side, and stomach. Back – You’ll see blue across the board, which basically indicates an even distribution of bodyweight on the bed. 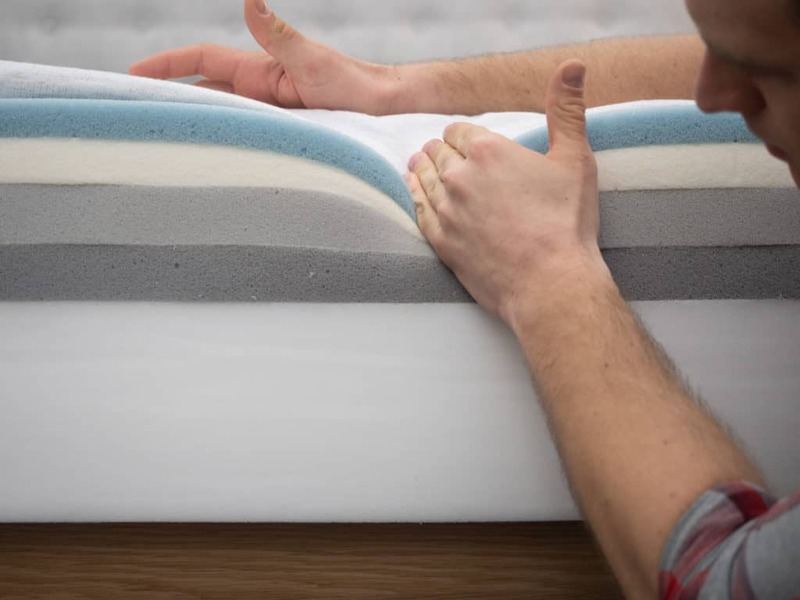 This means the layers of pressure-relieving polyfoam, bouncy latex, and supportive gel foam will all come together to keep the spine aligned — making this mattress comfortably supportive for most back sleepers. Side – The increased weight that sank into the bed meant there was a little bit of increased pressure when I rolled to my side. Luckily, the softness and sinkage from the top two layers provided enough plush cushion to relieve my body of any pressure pains. 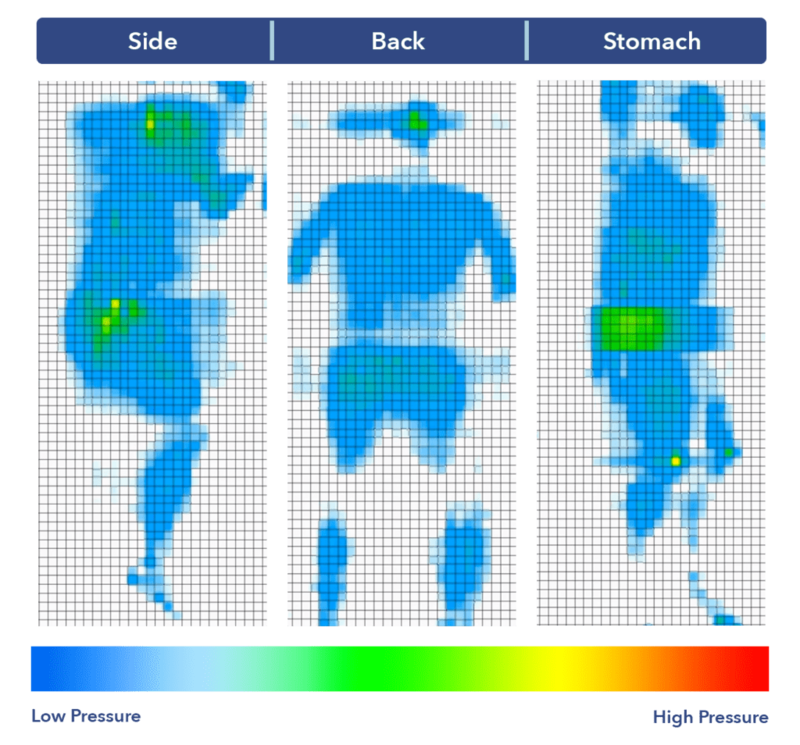 Stomach – Similar to sleeping on my back, there was blue across the board when on my stomach. While no pressure points seem to be forming, I do think The Wave might be too soft for most stomach sleepers who need a firmer mattress to hold up their hip joints. However, the flagship Casper is a bit more firm, so could be a great alternative! As I mentioned in the firmness section, I did sink a little bit in this bed, but didn’t necessarily feel “stuck.” A way to visualize this is to actually run a sinkage test. I placed four balls of varying sizes and densities (a 6 lb medicine ball, a 10 lb steel ball, a 50 lb medicine ball, and a 100 lb medicine ball) on the mattress and measured how much they compressed the surface. Based on the graph above, I did sink a little deeper into this mattress than I have on other beds I’ve reviewed, which reflected how I actually felt while on the bed. This sinkage is often a signal of solid pressure relief, a good sign for side sleepers who need to avoid pressure points from forming around the shoulders and hips. As far as feeling trapped, while you might sink a bit, the Casper Wave still has decent bounce thanks to its latex layer. The responsive foams on the top mean you will sink in a bit, but you won’t have to fight the layers to change positions, since there is some buoyancy. Said another way, you should be able to move with ease if you are changing sleeping positions. 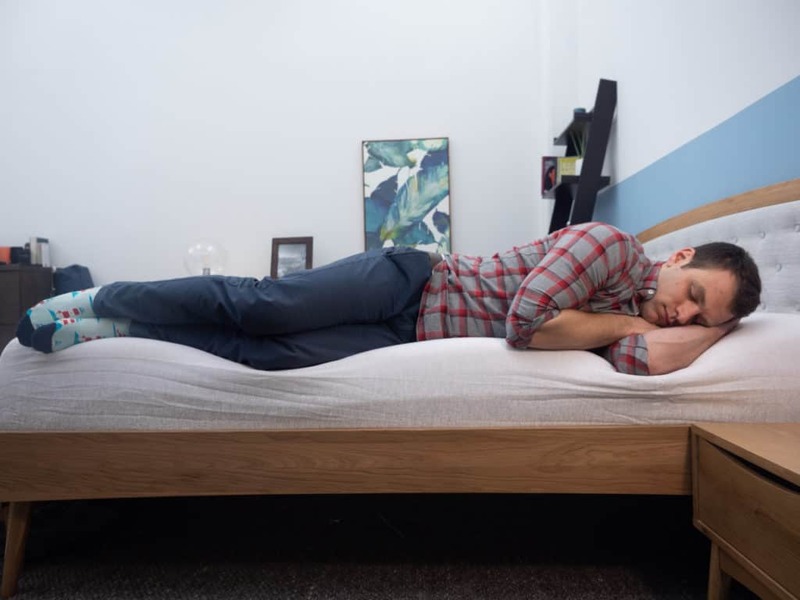 Understanding how well your mattress isolates motion is especially important for couples who might disturb one another if they toss and turn at night. While foam, especially memory, is sometimes known for dulling motion, I wanted to confirm this by running a motion transfer test. To do this, I dropped a 10 lb. steel ball from heights of 4 inches, 8 inches, and 12 inches and measured the disturbance it caused. The bigger the lines, the bigger the disturbance. Each drop is meant to symbolize a different movement you’re likely to experience in bed, from tossing and turning (4”) to getting out of bed (8”) all the way to full on jumping (12”). Showing the motion transfer test results on the Casper wave. I actually did see some motion transferred throughout the bed, so you might feel some movement if a partner jumps into bed at night. However, since this mattress isn’t as bouncy as a latex hybrid or innerspring mattress, the memory foam layer should help dampen most of that movement quite quickly. 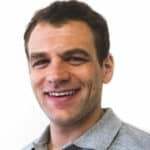 Now I’m going to compare the Casper Wave to the Casper Essential and the flagship Casper mattress in order to highlight distinct differences between each model. The Essential has a streamlined design and comes in at a lower price than other Casper models. This bed has a lower profile than The Wave, totaling 8.5 inches in height. In comparison to the five layers of foam in the Casper Wave, the Casper Essential has three — comprised of poly and memory foam. The Casper Essential is significantly less expensive, coming in at $600 for a Queen versus $2,250 for the Casper Wave. I’d say this is a budget-friendly choice for bedroom buyers. This bed is Casper’s first mattress, and might just be the most popular bed in a box on the market. The original Casper is 10” tall with four layers of foam, making it slightly shorter than the Casper Wave. The Casper mattress is a true medium-firm feel with integrated Zoned Support for pesky pressure points. 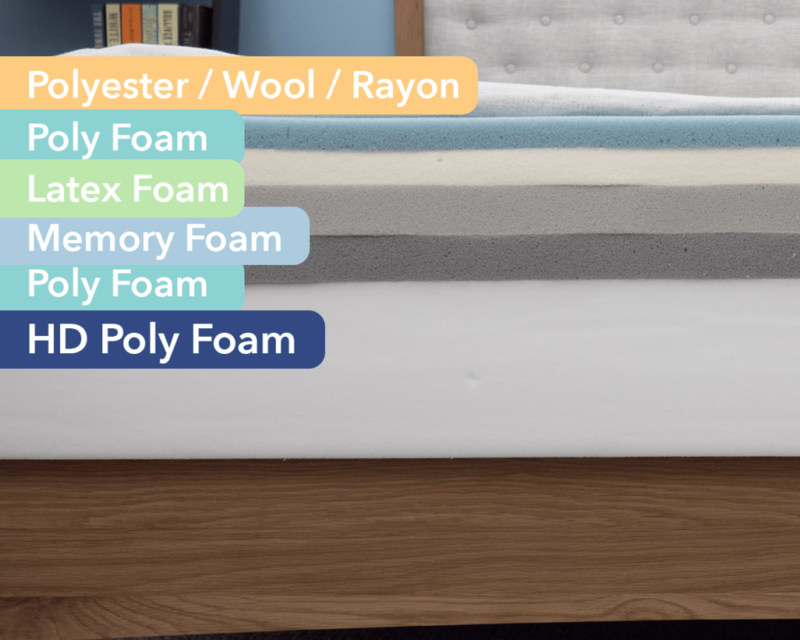 However, this support system doesn’t include gel foam, and is a more basic construct than the support system found in The Wave — a reason why this mattress is more affordable. Since the flagship model is a bit more firm, it would work well for certain stomach sleepers who need a touch more support. The Casper mattress provides a balanced foam feel, striking a nice balance of softness and support. A Queen costs $995, making this bed also more affordable than The Wave. Is the Casper Wave Mattress Right for You? Now that I’ve taken a close look at the Casper Wave, here are a few reasons why you should buy it, along with a couple details to watch out for. 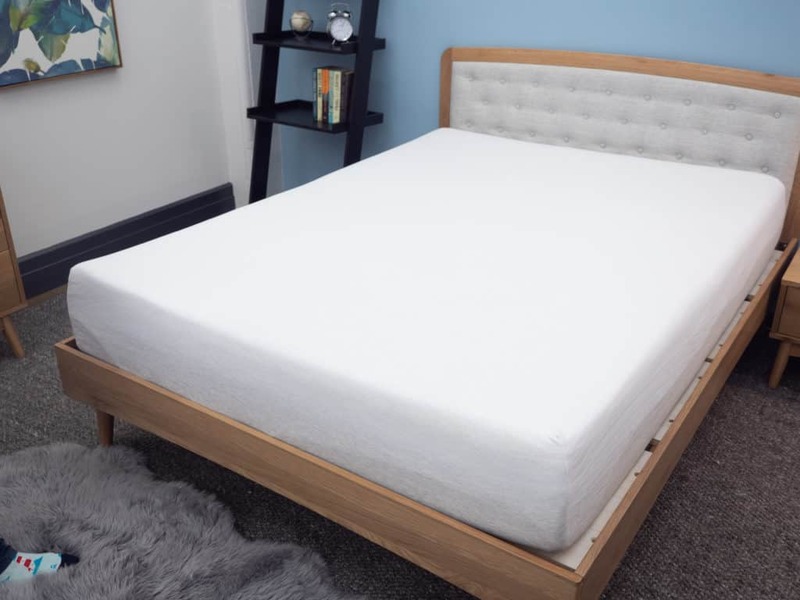 You’re a side sleeper – The pressure-relieving qualities of the foam, Zoned Support for the hips, and contoured channels for the shoulders, all make this a great option for folks who sleep on their side. You want something soft and sturdy – If you are looking for a soft mattress but still want to feel secure in bed, The Wave does the trick. The combination of foams — latex, polyfoam, memory foam, and gel — creates a plush feel mixed with support. You’re looking for luxury – If you’re willing to pay the price, The Casper Wave is worth it in my opinion. Having tested many luxury models, this mattress offers a high-end experience through its quality materials and smart design. It might be too soft for some stomach sleepers – If you strictly sleep on your belly, you might not get the firm structure you need from The Wave. I wouldn’t rule it out completely, but perhaps try one in a Casper retail store while also testing firmer mattress that’ll give your hips some extra support. It lacks bounce – If you crave the spring and mobility an innerspring or hybrid bed provides, you probably won’t get that on the Casper Wave. While I certainly didn’t feel stuck, this bed is not as bouncy as other mattresses that are constructed with coils. Excited about upgrading your mattress to a Casper Wave? Then check out the size and pricing information here. 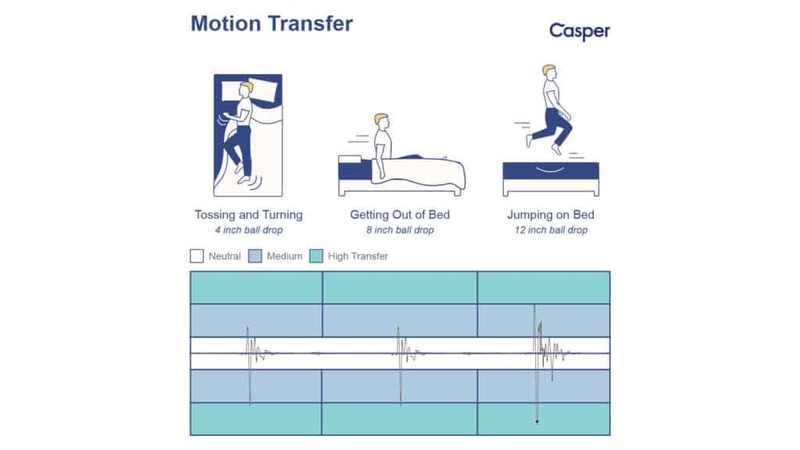 If you’re interesting in riding the Casper Wave all the way to your bedroom, here is some info on cost, shipping, and Casper’s sleep trial! That’s it for me and the Casper Wave review! Feel free to leave me comments and questions below. The Casper Wave is a luxury mattress model from popular bed-in-a-box brand Casper. The Wave uses a mix of latex and memory foam to provide a feel I’d call plush. 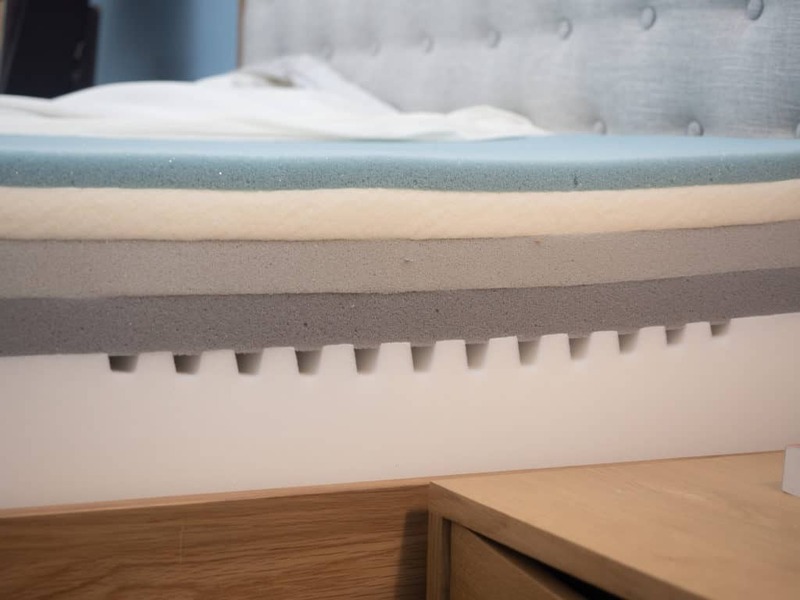 Zoned polymer inserts throughout the mattress provide extra support, especially through the hip area while special channels cut into the base create space for the sleeper’s shoulder to sink in, promoting spinal alignment.